Butterfly Bush for Hummingbirds. Attract hummingbirds and butterflies. Plant a Butterfly bush for hummingbirds. This page will explain: How to plan, How to grow and How to prune it. After looking at these considerations, you may want to include this plant in your hummingbird garden. The name Butterfly tells us that this plant attracts butterflies. By emitting an alluring perfume, butterflies are drawn to the lovely blooms. As a result, the flower has a long history of popularity with butterfly gardeners. (If you are interested in more information about butterflies, visit our friends at The Glorious Butterfly). Does this same plant attract hummingbirds? It is well known that hummingbirds do not have a sense of smell. The flowers from this bush is an attraction for hummingbirds because it has a high nectar count. Additionally, they are drawn to the long, brightly colored spikes resembling lilacs. 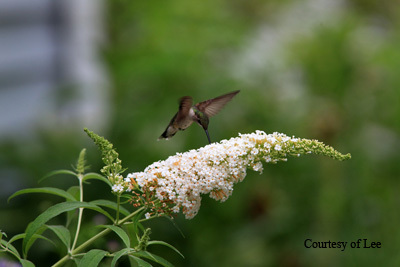 As a result, it is possible to create a butterfly and hummingbird garden by including this gorgeous bloom. We always recommend planning a hummingbird garden. Flowers grow in many sizes, shapes and colors. Without a garden plan your flowers will look haphazard. This is especially true when including this bush in your garden because of its size. Think about location - Okay, so now you are ready to draw a plan. Place these tall plants in the back of your garden. In the colder climates they grow 3 to 5 feet tall. In the warmer climates, they grow extremely tall, sometimes 10 to 12 feet. You might even consider planting these flowers in a separate location of your property. I admit that planning was a lesson for me. When I began gardening, planning was not a concern, What a mess!! How quickly we learn. 4. Provide sun requirements - Full sun is needed in colder states. They are hardy and grow well in partial shade in warmer climates. 5. Soil requirements - Well drained soil is preferred. Yet, they grow well in any soil. 6. Pruning a Butterfly bush - This easy to grow plant requires little care. Water during dry periods. Pruning is necessary. In the colder climates, simply cut the plant down to the ground in the Autumn. In a warmer climate they need more pruning. Trim them to your desired height. Cut off all diseased limbs when necessary. Don’t worry, this bush is hardy. 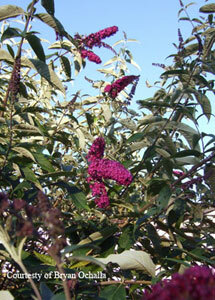 Butterfly Bushes bloom from July until frost, 8-10'' fragrant flower spikes that attract butterflies and hummingbirds. EASY TO GROW. Grows 3-6 feet tall. Mixed colors: dark purple, soft orchid-pink, lilac, reddish and snow white. Well started plants.